It was a long, wonderful Presidents Day weekend. We’re not sure why it is that so many more businesses here in CA observe the holiday, but we’re not complaining. And, we are pleased to report that we put the long weekend to good use. 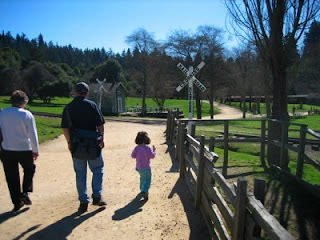 On Saturday, we headed for Felton, CA and the Roaring Camp Railroad. They run steam engines up into the mountains and also down to Santa Cruz. The mountain excursion is considerably shorter (and the only line running this time of year) so we took that one. Arriving early, we managed to spend a lot of time collecting rocks, watching ducks and turtles, getting hissed at by geese, and generally wandering the grounds. The place looks like it could get really, really busy in the high season, but it wasn’t too crowded when we were there, which was nice. So, the train pulled out and chuffed slowly up the hill. Sloooooowly. The redwood forest was beautiful and cool, and we all had a fun time looking up at the really, really tall trees. Interestingly enough, as we got going the exhaust from the engine got to blowing things out of the trees so we had lots of nice leaves and such land on us. We trundled over a trestle with the sharpest turning radius anywhere in North America, which was exciting. We also learned that redwoods open the pores on their leaves to soak in hundreds of gallons of water in the form of mist from the sea at night. Cool! The reason we needed the back engine, it turns out, was that the switchbacks part way up the mountain can only accommodate a six car train. So, the train was split up to navigate the switchbacks and then reconnected. It was pretty cool. After the train trip, we had a leisurely lunch (not very good-next time we’ll definitely bring a picnic of our own) and Elise got looking kind of sleepy. So, we stopped for coffee and directions and headed for home along the Pacific Coast Highway (CA Hwy 1). We drove along the coast from Santa Cruz to Half Moon Bay. “Beautiful” just doesn’t do it justice. There are small farms along the way so you can see green fields that end at the edge of big stone cliffs with waves crashing below. There are hills and trees and beaches and more fields all along the way, but pretty much the whole time you can look across to the ocean and watch the waves crash on the shore. (Unless you’re driving-then you kinda have to watch the road some.) At one point we drove through dense fog, and then a few miles later it was bright and sunny again. As we drove the rest of the way home along 280 (which is also pretty scenic at this time of year) we agreed that we can probably “get by” living within an hour and a half of such amazing countryside. The rest of the weekend’s adventures pale by comparison, but suffice it to say we had a good time and are coming at this week well-rested and full of excitement about the great things we’ll be seeing and doing as the summer approaches.